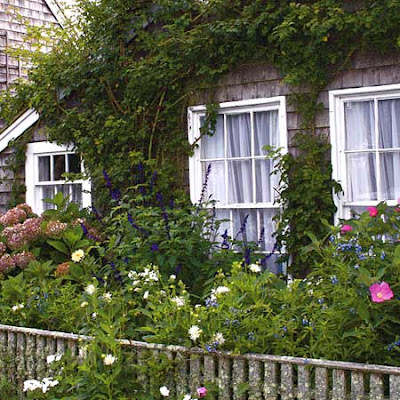 Classic cottage gardens—like the houses that give them their name—tend to be compact, informal, and highly individualistic. 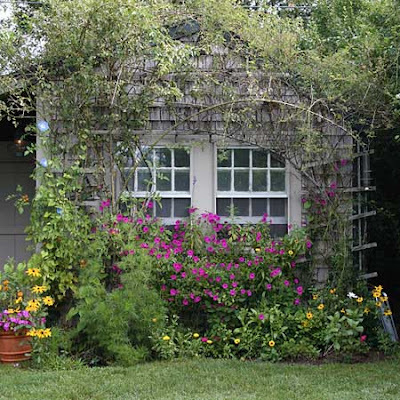 Located close to the front or back door, traditional examples display a harmonious mix of annuals, perennials, roses, shrubs, vines—even vegetables—in neatly tended arrangements designed to delight, rather than impress. Bricks laid in a diagonal herringbone pattern form a curving path dividing two wide borders. A hipped-roof birdhouse draws the eye upward. 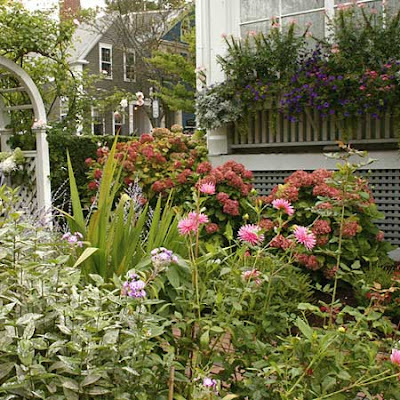 A classic rose-covered arbor and meticulously trimmed privet hedge provide architectural structure in a small yard overflowing with pink and purple flowering plants, including lush hydrangeas, old-fashioned garden phlox (foreground), and a wide window box filled with sun-loving annuals. 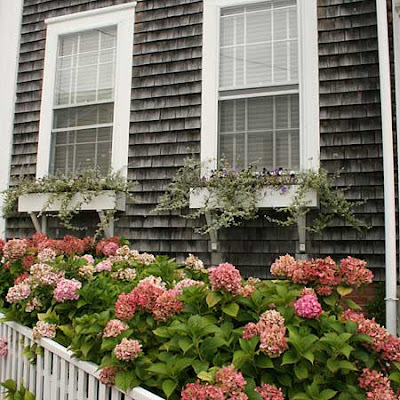 Belgian block frames a shade-tolerant border composed of 'Anabelle' hydrangeas, hostas, and ferns. 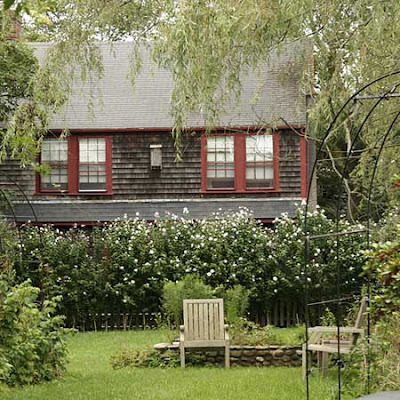 Under an arching weeping willow, a row of late-flowering pink and white rose of Sharon shrubs—planted closely together to create a privacy screen—gives this late-summer garden romantic appeal. 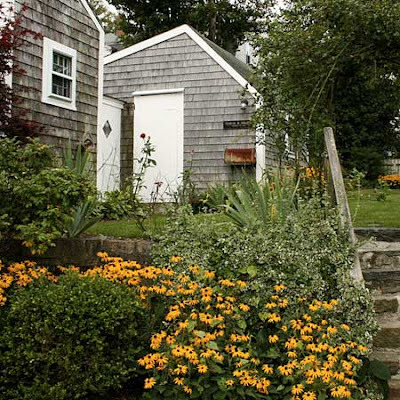 Favorite cottage-garden perennials—including black-eyed Susans (Rudbeckia), pink-flowering sedum, and pale-blue delphinium—create a vibrant border around a carefully tended lawn. 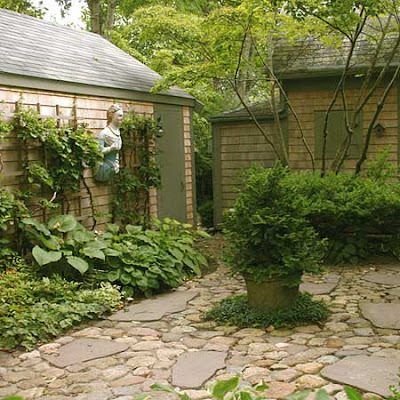 Greenery—in plants and painted trim—evokes a sense of tranquility in a cedar-shingled cottage's low-maintenance, cobblestone courtyard. 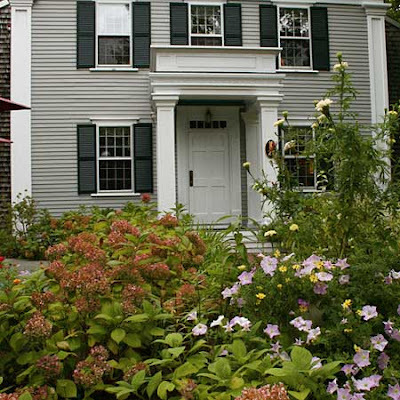 A Greek Revival dwelling gets a down-to-earth garden that takes the edge off its formality. A favorite of butterflies, golden Rudbeckia grabs attention in a casual country garden punctuated by a compact Japanese maple, neatly trimmed boxwood, swordlike iris foliage, and a rose-covered arbor. 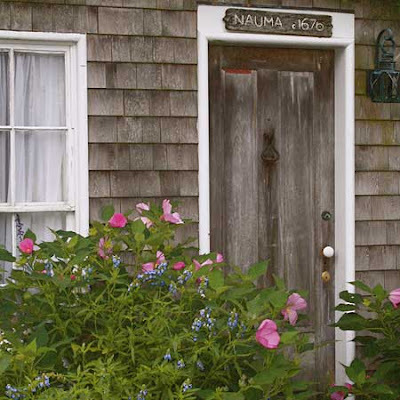 Inorganic elements—from the stonework to the timeworn mailbox and lozenge-shaped window on the back door—add immeasurably to the simple yard's undeniable charms. 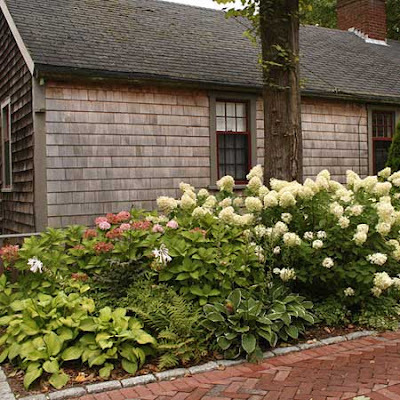 A row of hydrangeas makes a bold impact in a narrow patch of land. 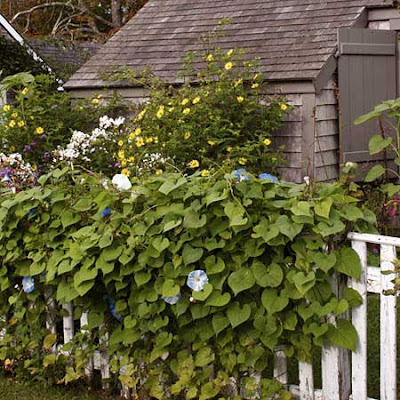 Easily grown from seed, 'Heavenly Blue' morning glories twine about a white-picket fence, their heart-shaped foliage providing a visual metaphor of simplicity and contentment. 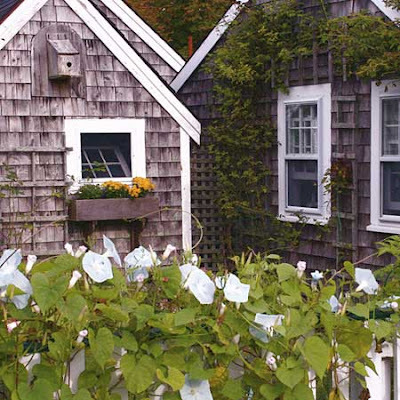 Tall cottage classics like lemon-yellow daisies and fragrant white phlox stand out against the silvered shingles of a cedar-shake outbuilding. 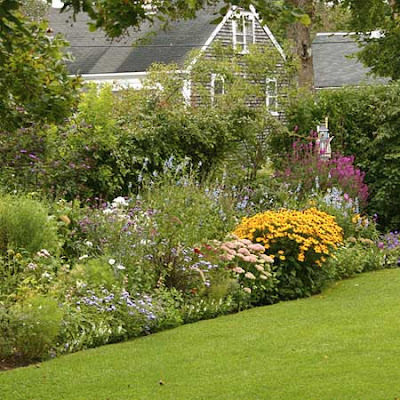 In the best cottage gardens, diversty reigns, with a wide range of roses, annuals, perennials, and shrubs sharing the limelight. Here, left to right, hostas, statuesque eupatorium, black-eyed Susans, snowy phlox, and eight-foot-tall hollyhocks (nearly gone to seed) harmonize in the yard of a rose-covered retreat. Billowing pink hibiscus blossoms greet visitors by the front door. Limiting the palette to two or three hues—in this case, pink, blue, and cream—keeps the mix harmonious. Hope you enjoyed those beautiful photos. Have a blessed day! Nora what pretty gardens! 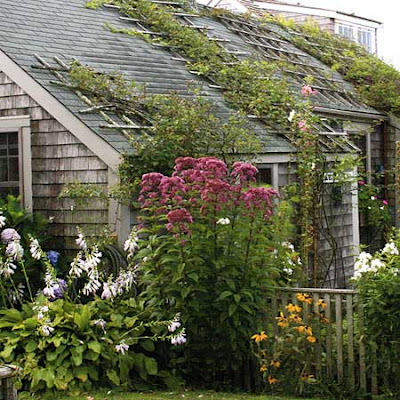 I adore cottage gardens. I've tried to make mine have some of the elements... I think its a little too chaoticy (is that a word?) 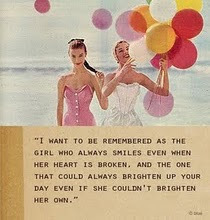 for my husband. It's hard to say which pic was my favorite. I love all the hydrangreas, but I would have to say - follow the brick road looks very nice. Beautiful! You got my attention with the brick pathway. Thank you for sharing such lovely photos. Did you take these pics or are these from a magazine? I think you have an eye for photography and gardens. To say that I enjoyed these pictures is an big understatement. I love how you posted so many...just like a garden tour. Sooo pretty! I love all the hydrangeas, I think they are my favorite! YUM! Oh how lovely........I adore a sweet cottage garden and these were ever so pretty. These are gorgeous. 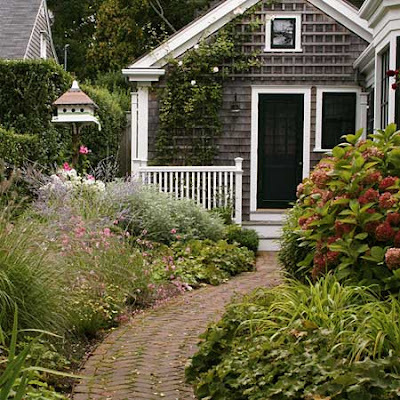 What I wouldn't give to have a cottage with a lovely garden! Thanks so much for taking the time to read and give feedback. Your comments brighten my days!